The Jeep Renegade may not have the best name in the industry or have looks that everyone will like but small crossovers do divide opinion, we are thinking Nissan Juke and Kia Soul. 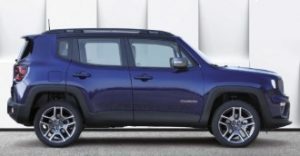 Jeep are owned by Fiat and the Renegade is built on the same platform as the yet to be released Fiat 500x, but the more boxy credentials of the Renegade do make for excellent space, the front doors open to seventy degrees and the rear to eighty degrees, easing access. While the car’s lofty ride height improves forward visibility, the large pillars do obscure your sideways view, but the climb into the cabin is not an uncomfortable one. The boot offers a competitive 351 litres with the seats up, and up to 1297 litres with them folded. To drive the Renegade is a little less fun than a Mini Countryman and a little noisier too but it is very comfortable. 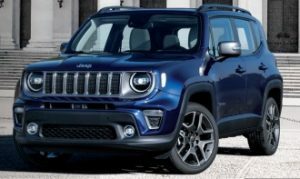 The Jeep renegade is available to Mobility customers in Sport, Longitude, Limited and Trailhawk trim. The entry level Sport comes with a 5 inch touch-screen system as standard, which you use to control the DAB radio, Bluetooth and general settings but the Longitude and Limited have an 8.4 inch system complete with Apple Carplay/Android Auto and a built in sat nav. Entry-level Sport models get 16-inch wheels, multi-function steering wheel, air-con, cruise control and push button start. Longitude cars add dual zone climate control, 17 inch alloy wheels, fog lamps, roof rails, rear parking sensors and second-row USB ports. Limited Renegades add heated leather seats and a 7 inch full colour instrument panel replacing the traditional dials. Trailhawk cars are 4WD only and come with 18 inch alloys, 9 speed automatic gearbox, hill decent control and selectable terrain settings. The new engines are a 1.0 three cylinder and a 1.3-litre four-cylinder turbo good for 148 or 178bhp. Only the top-rated 178bhp 9 speed auto can be specced with 4×4 drive, a six-speed manual is standard on the 1.0, while the 1.3 gets a six-speed dual-clutch. The 1.0 litre engine can reach 62mph in 11.2 seconds and return 46.3 miles per gallon, the 1.3 auto increases this to an impressive 9,4 seconds and still return 44.1 mpg. The 1.6 litre diesel produces 118 bhp and can hit 62mph in 10.2 seconds and return a claimed 57.6 mpg. The all wheel drive car is a 2.0 litre diesel with 170bhp paired to a 9 speed Automatic gearbox, prices start at £2195 Advance Payment.